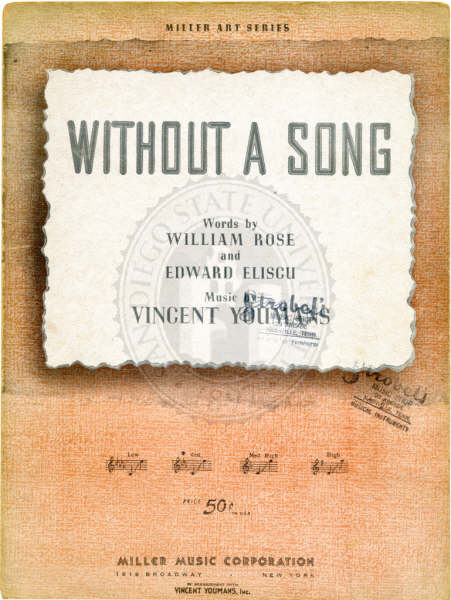 “Without a Song” was written for the 1929 musical Great Day. It has been recorded by artists ranging from Perry Como to Mario Lanza to Frank Sinatra. Great Day was set in 19th century Louisiana; as a result some of the lyrics have been changed over time to remove currently objectionable language. Without a Song was recorded on September 12, 1956 and released in 1957 on the album Tony. 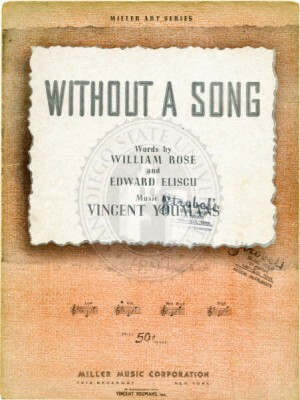 “Without a Song” was recorded on December 22, 1958 and released in 1959 on the album In Person! “Without a Song” was recorded live at Tony Bennett’s concert at Carnegie Hall on June 9, 1962, but was not released until 1997 on the album Tony Bennett at Carnegie Hall: Complete Concert. Ralph Sharon arranged the song.